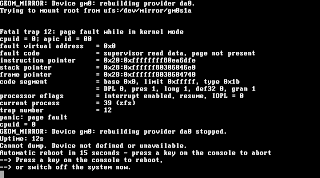 page fault while in kernel mode ?? Cannot dump. Device not defined or unavailable. DUMP: WARNING: Cannot use -L on an unmounted filesystem. chrome + rep2 -> bad request? localhost - - [18/Mar/2009:06:14:20 +0900] "POST /~pppppp/rep2/?guid=ON HTTP/1.1" 401 401 "http://localhost:8931/~pppppp/rep2/" "Mozilla/5.0 (Windows; U; Windows NT 5.1; en-US) AppleWebKit/525.19 (KHTML, like Gecko) Chrome/1.0.154.48 Safari/525.19"
localhost - p2user [18/Mar/2009:06:14:20 +0900] "POST /~pppppp/rep2/?guid=ON HTTP/1.1" 400 226 "http://localhost:831/~pppppp/rep2/" "Mozilla/5.0 (Windows; U; Windows NT 5.1; en-US) AppleWebKit/525.19 (KHTML, like Gecko) Chrome/1.0.154.48 Safari/525.19"